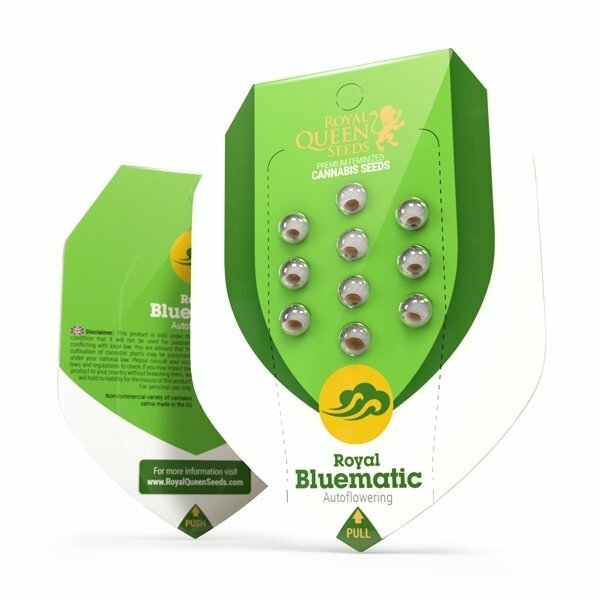 Royal Bluematic by Royal Queen Seeds is the feminized cross of the well-known Blueberry with the best of Royal Queen Seed’s genetics. The Blueberry itself is a famous species created by genes combination of Afghan and Thai hybrids winning the 1st prize at the “High Times Cannabis Cup” in 2000 and the 3rd prize in 2001. The Royal Bluematic is a cannabis strain that grows from medium to tall height for a variety reaching around 60-75 cm. Even though this vigorous weed provides intense productivity. Generally she will grow very few side branches and dedicates its entire energy to produce one large main bud. Due to this fact this cannabis breed is perfect for indoor type of cultivation. Royal Bluematic is a fast grower with average flowering time of 9 weeks from seed to harvest it will reward you with 70 g if properly grown. 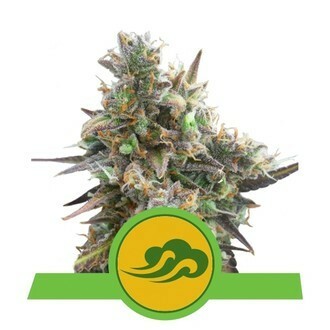 This is the best quality strain producing dense buds with sweet blueberry smell. Royal Bluematic has a lovely taste and Indica gene that provides a fine smoke together with a pleasant and relaxing physical stone. Zamnesia verschickt sehr schnell, TOP! Ich war etwas enttäuscht, von 3 gingen 2 Samen auf. Höhe Indoor etwa 50cm, Ertrag eher gering jedoch besser vom Turn wie die Jack.